We may not give our waste much thought, but the fact is our collective consumption and waste are wrecking havoc on this planet and countless other animals. Just because we throw something in a garbage can (or even recycle bin), it doesn’t mean the plastic will disappear. It doesn’t. In fact, a lot of the plastic we use can’t be recycled even if we wanted (due to components used in its making). We are using this synthetic material that doesn’t biodegrade for almost all of our disposable needs. And countless animals, both on land and at sea, are paying the ultimate price (dying) by ingesting or becoming entangled in it. The collective impact of our individual consumption choices can only be described as catastrophic for the entire planet and all life on it. 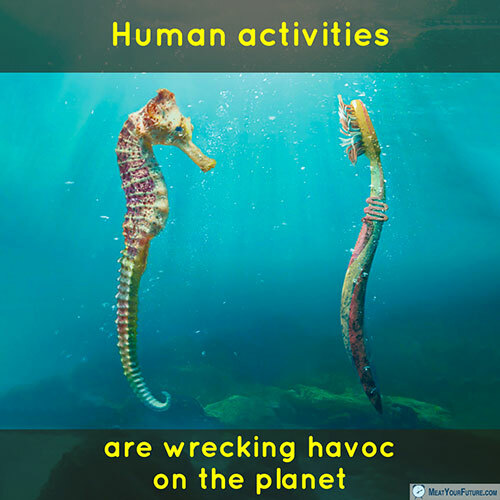 Unfortunately, the immense volume of waste we produce, which is already causing countless animals to die, is projected to continue rapidly increasing as our human population grows by nearly 230,000 people every single day. We produce so much plastic waste, that virtually every corner of the oceans (and life in it) is now contaminated. Please don’t be apathetic. Please do what you can to tread as lightly as possible. In addition to going vegan (which is urgently needed), please also eliminate all plastic use (particularly single-use) as much as possible, consider the benefits of smaller families, and be mindful of the immense impact our numbers and consumption choices have on the entire planet and all the other species with whom we share it. Do Your Traditions Also Harm Animals?